With a built-in optical heart rate the sensor, the Garmin Forerunner 235 does away with chest-mounted HR straps both when running and cycling. GPS + GLONASS reception makes for accurate location measurements even under tree cover or in dense cities, and an integrated accelerometer still keeps track of distance and pace even when running indoors. An easy-to-read color display makes it simple to see pace, distance, and heart rate zone in a passing glance, and Connect IQ support opens up the Forerunner 235 to thousands of custom workouts, widgets, watch faces, data fields and apps for personalizing the watch. Bluetooth connectivity allows pairing with a smartphone to receive text, call, and email notifications directly on screen, plus the ability to control music playback, and automatic activity uploading to Garmin Connect either by smartphone or WiFi makes logging runs and rides easier than ever. Available in multiple colors. Includes Forerunner 235 watch, charging / data clip, instruction manual. Dimensions are 45 mm x 45 mm x 11.7 mm. Display diameter is 31.1 mm. Claimed weight is 42 g.
I am new to the smart watch things, and I can honestly say that this watch has opened my eyes to how handy they can be. I am not great with technology, so the basic design caters to my weakness, especially the fact that it doesn't have a touch screen accessory. The product itself is lightweight, and although the face of it is large, I font find it to be too large for my liking. It's just right. The technology itself is very accurate in my opinion. The heart rate monitor is my favorite aspect personally, and it was the only reason I bought the watch after having concerns with my heart. I am a runner with a very low heart rate, and I was shocked to see it being reflected by my watch and almost didn't believe it, but after putting it on someone with a relatively high heart rate, It was proof that the heart rate monitor is accurate. As for the GPS tracker and foot step tracker, both of these accessories prove to be just as reliable comparing the tracked distance with my mapped distances on the computer. In conclusion, I have highly recommended this watch to any athlete looking for a durable, reliable, and fashionable watch. Enjoy the product, GPS connects quick, intuitive to use, plenty of data to troll over. Had this for a few months now and primarily use for running. The main flaw is the heart rate sensor - when I am running it seems to work just fine. However at rest its not always reliable, got to make sure it pretty secure and placed optimally on the wrist. Still would recommend - built for purpose. Primary reason for purchasing the Forerunner 235 was to track my running workouts leading up to cyclocross season. My Inititial impression of the 235 was that it seemed more like a toy than a piece of fitness equipement. The 235 is very light weight and build of plastic and rubber. Turns out despiite it's delicate appearance and feel it has proven to be durable. The wrist band is very comfortalbe to wear. The second thing I noticed was that the function buttons on the side of the watch are exposed. This does make the buttons easy to access while exercising. It also makes them easy to inadvertantly select during your workout possiblly leading to lost workout data. The biggest disappointment with this watch is the optical HR sensor. While exercising the HR sensor has never worked correctly, not once. I found that while exercising the 235 would show very elevated HR's, 50-60 beats above my max HR. This happened everytime I used the 235. I eventually had to pair the 235 with my Garmin HR chest strap, which worked just fine. I don't know if the optical HR sensor works better on more expensive models but I think it is ridiculous that the HR sensor performs so poorly. While wearing the 235 during the day(not exercising) the HR sensor seemed to be accurate. With the 235 your can track your daily steps, monitor your sleep patterns. The 235 will also track your runs on the treadmill. The GPS function works very well. All the data from the 235 can be synced with Garmin Connect, Stava, Training Peaks etc. The battery last about 4-5 days between charges. The 235 is inexpensive for a reason. All the functions I need as a crossfitter and cyclist. Very comfortable. Easy to use. Lots of cool add on apps so you can customize. I purchased primarily for running but also use for biking. The different stats help me to make adjustments in my training and find them interesting. Also track my sleep and trying to make improvements there too. The Garmin Forerunner 235 is a great GPS smart watch at a great price. I use the watch for mainly running, mostly on the trails. I have a Gramin 520 plus for cycling which can communicate with my Forerunner 235 - Very COOL! The multi-screen display helps me keep in the right zone all the time. Love the Garmin Connect Application on my smartphone - automatically upload stats for every activity including, sleepwalk, run and many more if you choose the activity. Needed to replace my Vivofit after a bike crash. I love this as my go-to watch. I wish it had a few more features to capture other sports as well, but for daily tracking, HR, and runninghiking. Granddaughter is a runner & loves the watch. I had tried a few smart fitness watches in the past, but they were always missing something for me - not waterproof, had touchscreen functions that didn't work while running with gloves, restrictive battery life, poor smart notification execution, no built-in GPS, and my biggest issue requiring a button push or special wristarm movement to show the clock! I wanted something that was a watch first (clock face always on), had good sportfitness tracking capabilities (including waterproofing and built-in GPS), could go at least a few days without charging, and was decent with phone synchingnotifications. This watch hit on everything for me, and is really comfortable to boot. And to top it off, not only does it have a built-in heart rate monitor, it's able to broadcast it via ANT to your phonecycle computer - no chest strap needed! While I want to start doing triathlons, the XT and Fenix series watches were a bit cost-prohibitive, Well, I did have an opportunity to get a 920XT for about $20 more than what I paid for the FR235, and even though the 920 has more features and better battery life, I hate how bulky it is and the overall design (I much prefer round watch faces, the size of the 235 is similar to many normal watches and with it's more subtle design it doesn't look completely out of pIace with a suit). 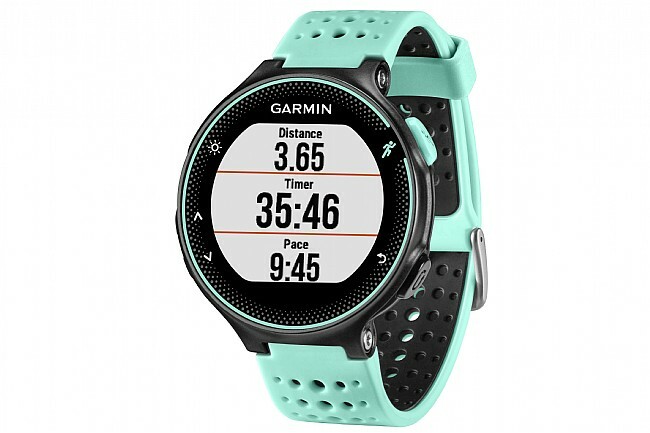 I was also lucky enough to get this on Cyber Monday while BTD was having a special Garmin sale along with extra savings they were offering for the day, along with some VIP points I had, plus $5 off for picking it up at the wharehouse! In all, I paid the same for this as my wife had for a Fitbit Blaze she had gotten me a few months before (returned that after a couple weeks), and that device isn't even close to the level of the 235. Another big plus is the Garmin ConnectIQ store. This is where you can get additional appswidgetswatch faces for the watch. While it's still relatively young and so is still somewhat limited, it's open to 3rd party developers (so, everybody), and so new appswatch faces are released frequently. Since I wanted something I could track my swimming with, I only decided to get this watch instead of spending more on an XT series when I learned of a pool swimming app a guy made for the 235. I swim a couple times a week and the app works great! They even have triathlon apps that track the time for each discipline including the transitions! It does everything I need and more. Wrist HR monitor is good and reliable. Sillicone band is very soft and comfortable so I wear this watch all day. Delivery was very quick and costumer service is excellent as I called in for a price adjustment when watch went on sale few days after my purchase. I run 1500 miles a year and I put off buying a watch for way too long. Heard awesome reviews on the 235 and started to look around. Bike direct was by far the best price and I knew they had great service. Garmin support is awesome too, called to ask about some features and they walked me right through it. Love not needing a HR strap. Uploads to Garmin Connect and Strava. Garmin Forerunner 235... Most Excellent! An excellent GPS watch! I also have the Garmin Forerunner 620 touch but this watch (235) is easier to use. It connects to the satellites super quick, the battery life is much longer in-between charges. 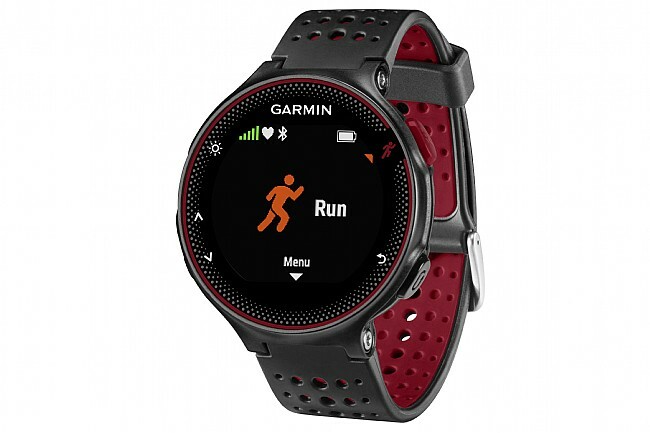 It downloads software when connected to a computer very fast, and Garmin Connect tells you all about your running and health...more than you will ever need. For my purposes of running and cycling it is perfection! I'm a runner and use this to track my work-outs. A great product except for the instruction booklet that came with the watch, which is basically useless. 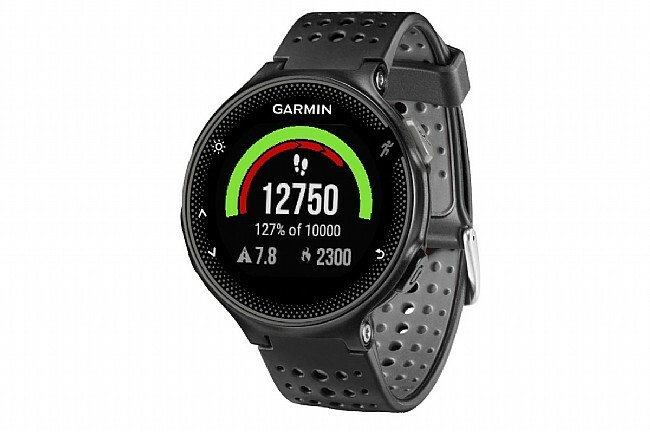 On-line guides from Garmin are equally difficult to interpret, making the watch much more of a challenge to use effectively than it should be. Price and service support offered by BikeTiresDirect.com was excellent. Very happy with the product except for Garmin's lack of clear, simple usage instructions. YouTube support videos don't help much either. Watch is great, software has glitches. I love this watch! I just wish Garmin would get their act together and fix the software problems. My watch has never displayed texts like it is supposed to since the first day I got it, but it does show calls that I am getting, so I know the Bluetooth works. I'm also not a big fan of their app, the Fitbit one is better. Also, the sleep data isn't too accurate. Says I'm still sleeping even when I'm awake, but my old Fitbit used to do that too. The watch itself is comfortable to wear and looks great. I'm really happy with it. Used only for running. Works well with iphone app from Garmin. I returned this watch after using for about 30 days. The HR wrist readings were not providing any data. I think is a problem with the specific watch that I got not the whole GF 235 batch. I compared against a garmin 35 that a bought for my wife and the he wrist reading works just fine. I probably will buy another 235 or a 35. Got to get used to its usage although simple. I wear it all the time even with the other watch. Like the constant heart monitor without the annoyance of the chest strap. The bracelet has to be relatively right to get good reading. This watch is amazing for runners!! love all of the features! I love the heart rate monitor, gps, and pedometer. The app it works with is great too. You can really break down your runs to improve your overall effort. Garmin Forerunner 235 is very comfortable and useful. I did training without a GPS watch for my first Ironman in 2016, so I knew I wanted to look for one as I prepare for my next Ironman in 2017. I just couldn't justify the price of the 735XT with chest straps. Even though the 920XT prices has dropped, the watch just seemed bigger and older to me. In December 2016 I bought the Forerunner 235 and it has been greateasy to use. I like using the live tracking so my family can be involved with my training, set up is very simple. At the end of each run I've been able to use Garmin Connect to study my performance and route. I like the statistical readings of the workout, and can start to compare each workout. The watch is extremely light weight on my arm, and the wrist band is very comfortable. The optical heart rate sensor has worked great as well. I have noticed the optical HR readings are similar to other chest strap senors I've worn in the past while running and biking, so I haven't bought a chest strap for this watch. While on the trainer I've warn the watch on the opposite side of my wrist so I can read it while in the aero bars, and the optical heart rate senor picks up my heart rate just fine. This week I linked my watch to the Garmin CadenceSpeed sensors for workouts on my fluid trainer, but haven't yet used it there much. The watch display isn't as brilliant as online photos make it look, but that's not a problem. I find the battery life to be adequate - I wear it for 3 or 4 days before I charge it over night. I've downloaded a few apps from Garmin Connect IQ stopwatchtimer (awesome), Swimming (haven't used yet), SR1 watchface (good). I use to miss text messages when my phone was in my pocket while coaching, but now with the notifications, I always know when I'm being contacted. I'm sure you'll enjoy the Garmin 235.